Cheerleaders provide school spirit, unity and support, and are often at the heart of student activity. From coming up with ideas for great new cheers to pep rally inspiration, cheerleaders have a host of responsibilities. 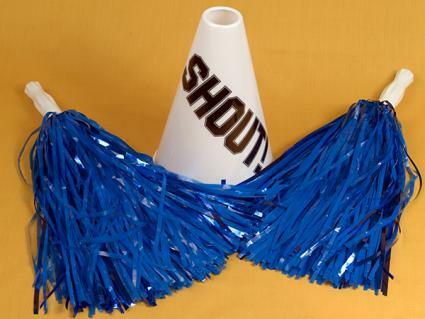 Pep rallies, school spirit assemblies and senior programs are all great spirit building activities, but it can be daunting to come up with unique cheerleader ideas for these events. Humor is often popular, as are unexpected twists to standard rally activities to get the school laughing and revved up for a big game. Sponsor a funny contest, such as who can dress like the biggest nerd or wear the craziest hat. Put together a skit to perform in front of the school. Getting teachers or staff involved in a skit can really add to the appeal. Pass out items at lunch or in class, such as caramels when playing a team from "Carmel" and a note that says "chew Carmel up." Get the band involved and play and sing the school song. Hold a dance-off between cheerleaders and teachers. Some moves may be illegal at a competition, so review the rule book. Everyone should look exactly the same, right down to your hairstyle and shoes. Facial expressions are important at a competition as cheerleaders are judged on presentation. Practice in front of a mirror to perfect your cheerleader attitude. Judges and fans will see you from a distance, so stage makeup is appropriate. Tumbling and stunting are vital if you plan to win. The underlying dynamics of a cheer squad naturally change from year to year as new cheerleaders come into the program, old ones leave or graduate and new personalities arrive on the scene. Starting the season off with some basic team building exercises can help create bonds between cheerleaders and avoid some of the conflict that might otherwise occur. Try one of these to start. Each cheerleader takes a turn free falling backwards and trusts that the girls behind her will catch her. Form groups of four and run relays around the gym, passing the spirit stick as each person is tagged. Throw a lock-in and have the entire squad bring sleeping bags and spend the night in the school gym (get permission from faculty or hold at someone's house). Place a piece of tape down the middle of the room. Make statements and instruct the girls to step over the line if the statement applies to them. 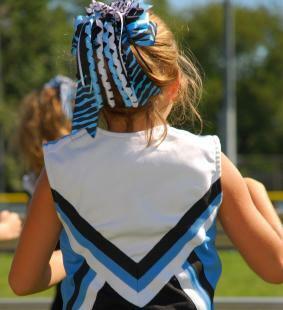 For example, you might say, "This is my first year cheerleading," or "I dropped a spirit stick once." When it comes to putting together a unique uniform, your imagination is the only limit. Even dance outfits can provide inspiration, especially for halftime performance wear. As you go through the year, you'll likely come up with new ideas and unique cheer events on your own. Brainstorm with other cheerleaders and be willing to try different things to get fans excited about the team you're cheering for. A great way to find inspiration for cheers, pep rallies and showing school spirit is to pay attention to what other cheerleaders across the nation are doing.